Introducing Extracoporeal Shock Wave Therapy (ESWT), a non-invasive procedure used to treat chronic heel pain, plantar fasciitis, heel spur syndrome, Achilles tendonitis, and other foot problems. This procedure uses therapeutic pressure waves to target the area of pain directly. The entire procedure only takes about 15-35 minutes. Even though this a fairly new technology, it has successfully healed hundreds of thousands of patients worldwide. This is why Dr. Gotman has included it in her own practice. What Should I Expect From ESWT? Instead of cutting into the foot in open surgical procedure, ESWT is a non-invasive treatment technique that relies on pressure waves to heal the affected area. This reduces the risks of nerve and other damage. Patients do not typically experience any burning or unpleasant sensations during the treatment. If you do, we modify the technique. Miami podiatrist Dr. Gotman performs this technique in her Kendall office. What is the ESWT Procedure? After a brief evaluation of your medical history, Dr. Gotman manually evaluates the painful area and marks the trigger point on the heel. She applies ultrasonic transmission to the foot. Dr. Gotman then uses the ESWT hand piece to gently and thoroughly transmit shockwaves over the injured area. Using your feedback, the positioning of the applicator, along with the measurement of the impulse frequency, will be adjusted. Once you are comfortable, the energy is gradually increased over several minutes until the procedure is complete. Dr. Gotman's experience gives her confidence that the results from ESWT procedures significantly heal the affected area better than open surgery or other treatment regimens. Post-ESWT therapy and continuing care visits are recommended by Dr. Gotman for 1-3 months following the procedure for maximum benefit and proper healing. 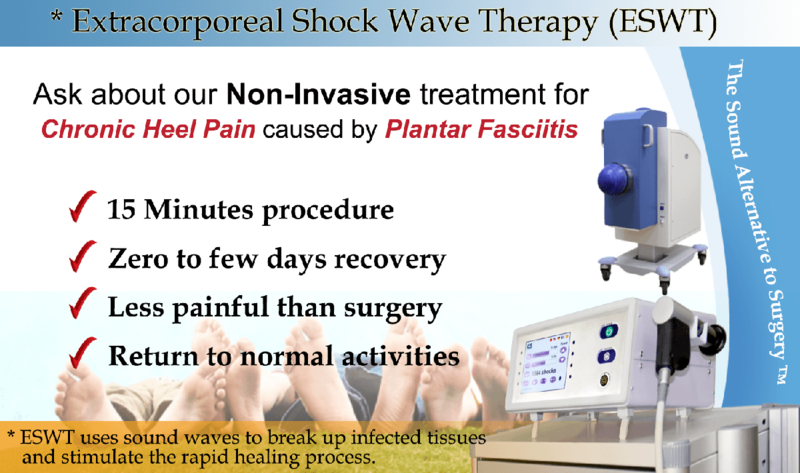 Looking to learn more about Extra Corporeal Shock Wave Therapy treatment for foot and ankle? We invite you to make an appointment today with Miami Podiatrist Dr Sandra R Gotman. We are conveniently located in on SW 40th Street in Kendall.